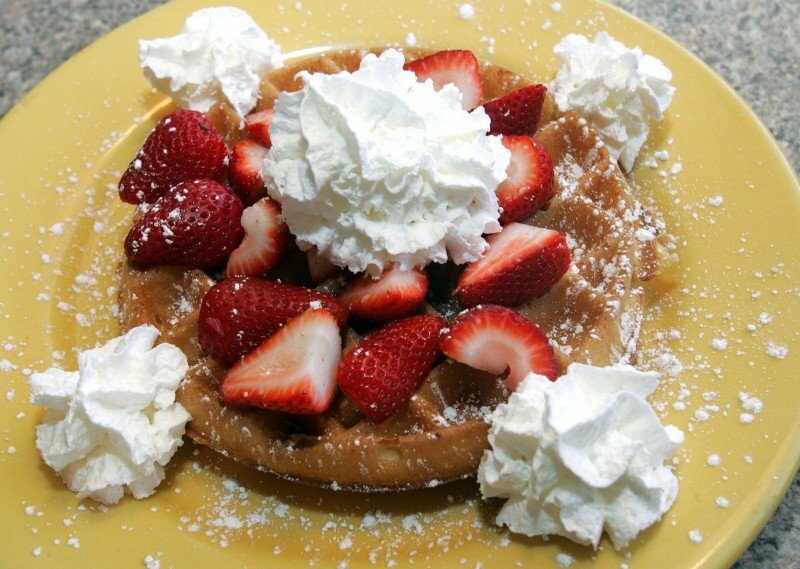 There are 25 to 30 items each for breakfast, lunch and dinner, including strawberry waffles. The Coppertop is spacious and clean, with floral patterned maroon booths and carpeting best appreciated by grandmotherly types. The Coppertop restaurant is a Madison institution that has been in the Jonuzi family for 25 years. The Coppertop restaurant, which sits on a hill next to Vitense Golfland, is a Madison institution that has been in the Jonuzi family for 25 years. Bob Jonuzi and his cousin, Nick, took over the business from Jonuzi’s aunt in 1996. Some customers have been coming in for the full 25 years, said Jonuzi, who estimates that 80 percent of his clientele are regulars. The restaurant also draws groups who meet there weekly. And well-known people in the community like UW athletic director Barry Alvarez and Sen. Russ Feingold have made recent visits, according to Jonuzi. The atmosphere is spacious and clean, with serene, floral-patterned maroon booths and carpeting. Service was efficient, attentive and well-timed during two visits that found good-sized crowds. There is an extensive menu, with 25 to 30 items each for breakfast, lunch and dinner. Specials are listed on a large white board brought tableside by the host. The Albanian chicken panini ($7.99) was a fantastic grilled chicken sandwich with feta cheese, grilled onions and green peppers with a touch of mayonnaise. The smothered chopped steak ($9.99) was also good, with a generous portion of good-quality hamburger meat grilled with green peppers, mushrooms and onions, and served au jus. The plate also held a half-ear of corn. On a lunch visit, we had the breakfast-anytime Italian omelet ($7.99) with mushrooms, tomatoes, onions, sausage and mozzarella cheese topped with tomato meat sauce. The omelet and the sauce were both bland and the mozzarella, unfortunately, was Velveeta-style. It came with a choice of hash browns or American fries and pancakes or toast. Both the hash browns and the two thick pancakes were fine, but nothing special. The Reuben ($7.99) was a thin sandwich with thick slices of corned beef, a light amount of sauerkraut and Swiss cheese between two generously buttered slices of rye bread that were perfectly grilled. The cheese was, again, the processed variety. Most meals come with two sides: french fries, soup, salad or fruit. The fries were extremely crispy and coated in a delicious batter. The soups we’ve tried have been stellar. A creamy spinach wasn’t too thick and held just enough spinach, and a potato soup was plain yet flavorful. Both had a few flecks of carrot and were served tongue-scorchingly hot. A green salad was topped with a smattering of purple cabbage, a cucumber, a tomato wedge, and two slices of red onion, while a bowl of fruit contained a welcome selection of cantaloupe, honeydew melon, red grapes, watermelon and strawberries. For dessert on our dinner visit, we went with the chocolate chip cheesecake ($4.29), the best-looking item in the pie case. It came with two dollops of whipped cream topped with chocolate syrup. The crust was light, but the filling was so rich that the two of us could barely finish it. 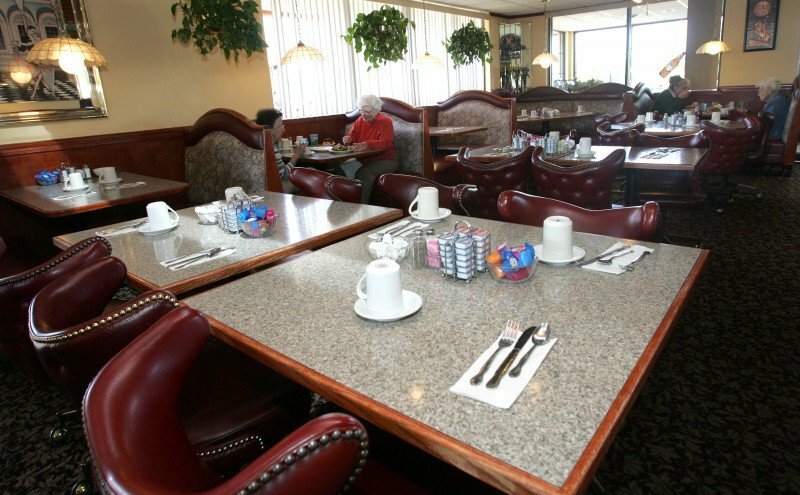 I have a great affection for diners like the Coppertop, which does most everything with more heart and aplomb than chains like Denny’s and Country Kitchen.